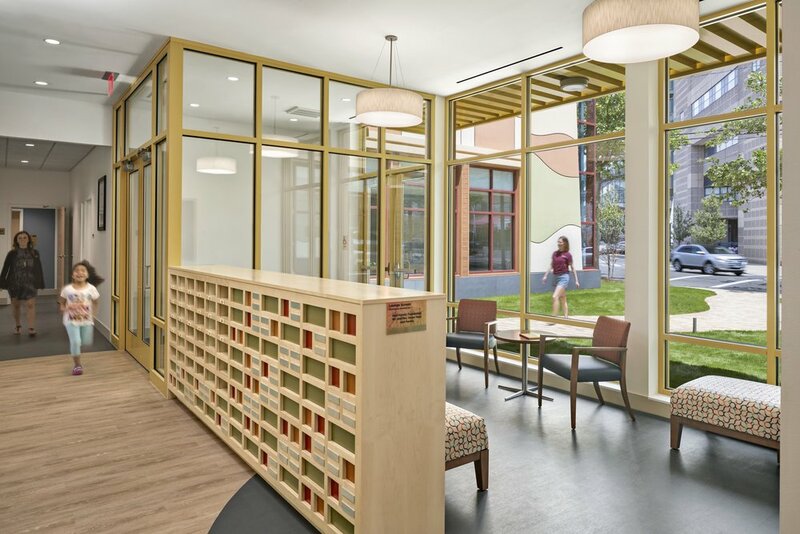 In partnership with Svigals & Partners Architects, the design team's goal was to ensure a supportive environment for families of patients visiting Yale New Haven Children's Hospital, conveniently located directly across the street. To achieve this goal, the design team defined which behaviors could be influenced through our services by creating an environment that creates a sense of community, illicit a sense of home and delights the senses. To build community amongst the residents, the design team planned programing offerings that offered opportunities for communication and collaboration. One such example is the Demonstration Kitchen. Simulating a residential kitchen, the communal seating and open counters allow for families to cook and share meals together. To offer stress relief from long days spent at the hospital, the commercial building was designed to illicit a sense of home through hospitality cues and residential features. Thoughtful application of paint color patterns were used throughout the building to further distract families from their stress, while simple design features were used to create a calming atmosphere. Throughout the facility there are many “pockets of peacefulness” - private or semi-private moments for families to take a breath and rejuvenate. Sometimes located off a residential floor corridor or offered through a small play area, these moments serve to give families a variety of spaces and levels of privacy appropriate for activities ranging from play to mourning. Each one of these moments are flooded with natural light and provides views to the outdoors. We consider work like the Ronald McDonald House of CT at the very heart of our practice. Sometimes thoughtful paint and simple programming can produce massive effects in uplifting individuals and families in need of support.